Colorado is well-known for the awe-inspiring Rocky Mountains, outdoor recreation and the hundreds of craft breweries nestled in the mountain towns along scenic byways. This tour will explore the iconic sites of Colorado. From the bustling city of Denver to the glamorous village of Telluride, we will ride a narrow gauge train, shop boutique galleries in Aspen and sample some of the most creative craft beers in the US. DAY 1: Mingle with other group members at a meet and greet reception hosted by our guide, a beer aficionado and destination specialist. DAY 2: Catch stunning views of the Rocky Mountains in between stops at historic and cultural locations, emerging neighborhoods and hidden gems of the Mile-High city. In the brewery district of River North tour some of the 45 breweries located in this capital city. Travel to Aspen along highways that are lined with jagged cliffs, winding roads over high-alpine passes and switchback turns with views that will keep your camera snapping. Take a casual 12 block stroll through historic downtown Aspen to get acquainted. DAY 3: Enjoy a leisurely morning hike through the Maroon Bells Wilderness. Or, beginners as well as experienced rafters can raft the Upper Roaring Fork. This section of river features beautiful scenery and wildlife. Meet in the afternoon for tastings at Aspen Brewing Company. DAY 4: Travel through McClure Pass, one of Colorado's most scenic byways. A trip on the West Elk Loop passes through national forestland, wilderness preserves, state and national parks. Upon arrival in Telluride explore the town on foot. Finish the tour at Telluride Brewing Company to quench your thirst with beer from one of the highest microbreweries in the world. DAY 5: Travel along the Million Dollar Highway today between Ouray, and Silverton. Much of Silverton is considered a National Historic Landmark and is the depot town of the Durango & Silverton Narrow Gauge Railroad. This 3-ft. narrow gauge heritage railroad has been in continuous operation since 1882. 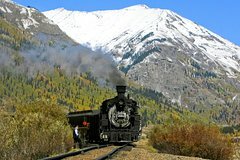 We’ll ride the historic railroad along the Animas River, through wilderness inaccessible by any road, for a steam-powered arrival into Durango. DAY 6: Visit Mesa Verde National Park, the largest archaeological preserve in the US. Explore cave dwellings inhabited by groups of nomadic American Indians as early as 7500 BC. Back in Durango visit one of the oldest craft breweries in the state. DAY 7: Depart for Colorado Springs, stopping in route in Salida, a quaint, western style town with a creative arts scene and a selection of breweries, distilleries and wineries. Visit the Royal Gorge Bridge & Park. Hanging high above Colorado’s Arkansas River, the Royal Gorge Bridge is America’s highest suspension bridge and a legendary feat of engineering renowned the world over. An included final night pairings dinner will feature Colorado Springs’ internationally diverse cuisine and big tastes from small, local beer companies. DAY 8: Visit the historic mining town of Cripple Creek. Old brick buildings along the main streets will take us right back to the Old West. Tour 1,000 feet below ground to learn about the workings of the 1890s hard rock gold miner.